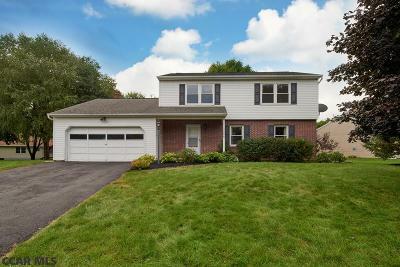 Don't miss out on this cul-de-sac opportunity in Good Hope II close to Autumnwood Park and just over 3 miles to downtown State College and the Penn State campus. This well-built Zimmerman Home with 4 bedrooms & 2.5 baths has been lovingly maintained by the original owners. Enjoy the spacious rooms in one of the largest floor plans in the neighborhood or take in the peaceful setting while relaxing under the covered front porch. This quality home includes a ductless mini-split heat pump with A/C and Energy Star Rated windows. The unfinished basement with outdoor Bilco door access and rough-in plumbing allows for additional finished living area possibilities. Professional landscaping with mature trees and the back patio offers endless outdoor living space potential. This is a great home in a great location in a great neighborhood so schedule an appointment today to come take a look! Directions: From Downtown State College, Take West College Avenue (Route 26). Turn Right On Bristol Avenue, Turn Right On Fairfield Circle.